This is the first in a series of brief articles dealing with the importance of mycotoxins in agriculture, and how these impact human and animal health. To start, we know that fungi (or moulds) are micro-organisms that occur throughout nature: In the soil and in water, the air and on plants. We can identify fungi as being the powdery or woolly moulds that we often see growing on stale bread, cheese and rotten fruit. Some fungi are known to cause plant diseases and therefore become important in agriculture due to their associated economic losses. As further explanation, mycotoxins are poisonous chemical compounds that are produced by certain fungi under natural conditions. The function of these mycotoxins and the reason for their production remains largely unclear since they appear to play little or no role in the normal growth of fungi. There are many such compounds, but only a few are regularly found in food and feedstuffs such as grains, other seeds and nuts. When these mycotoxins are present at high enough levels in our food, they then pose a significant health risk to humans and animals. 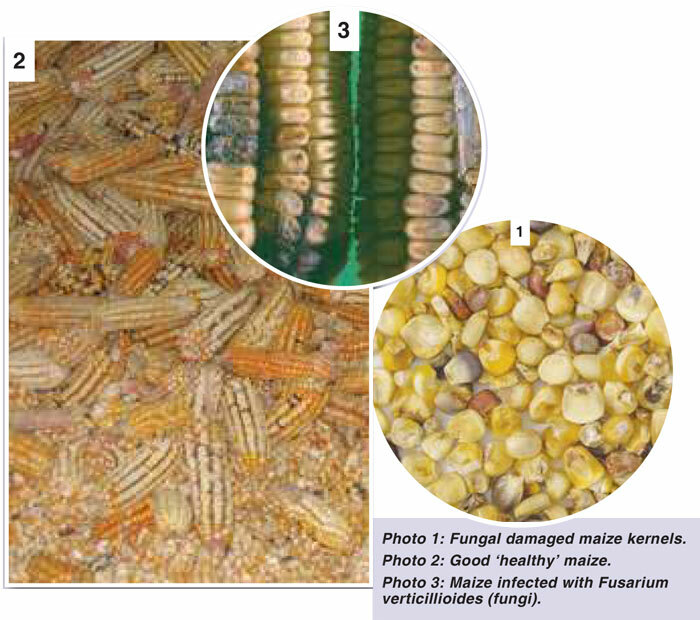 Since they are produced by fungi, mycotoxins are usually associated with diseased or mouldy crops and food products. 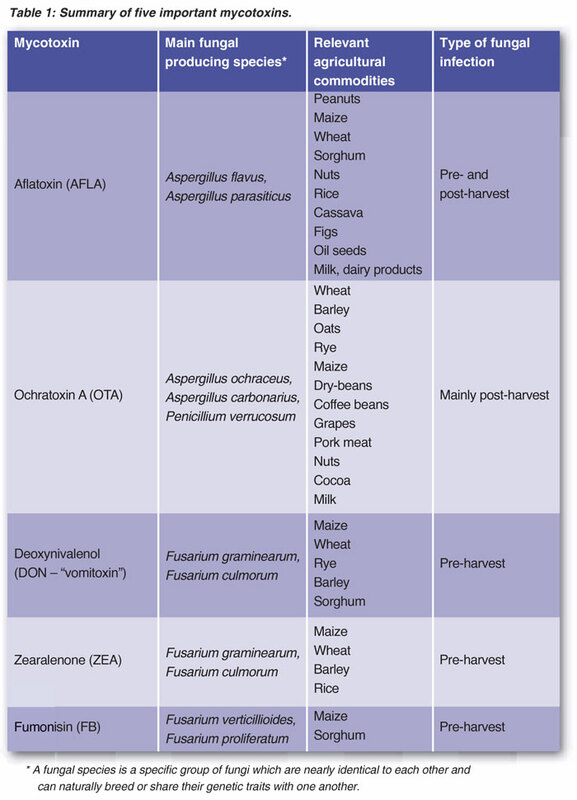 Mycotoxins can infect food commodities during pre- and post-harvest periods, storage or during food processing. Due to the heat and chemical stability of most mycotoxins, they can only partially be removed through food processing and/ or decontamination procedures. Information about food-borne mycotoxins is far from complete, but enough is known to identify them as serious problems in many parts of the world. Mycotoxin contamination of crops can occur due to adverse climate conditions and also inadequate agricultural practices. High humidity (> 85%), high temperatures (> 25°C), insect and rodent damage, improper drying of crops, and water damage in the storage structures are but a few of the issues which can increase fungal and mycotoxin development. species, ochratoxin A (OTA) produced by Aspergillus and Penicillium species, deoxynivalenol (DON), zearalenone (ZEA) and fumonisins (FB) produced by Fusarium species (see Table 1). Economic impacts – yield loss, lower crop value, loss in household income, negatively affects livestock health. Impact on humans – long-term and shortterm diseases and health conditions, food shortages and hunger. Fungi and mycotoxins are a part of nature and can never be completely eradicated. Farmers must, however, take notice of these issues and plan their agricultural crops and practices according to the latest available knowledge to ensure safe and healthy crops. In the next issue we will explore this topic in more detail by focussing on mycotoxins relevant to the South African maize industry, answer questions such as what are safe levels of mycotoxins in maize (commercial maize versus rural subsistence maize).